Over the years, our team has carefully picked out and added items to our menus to create one of the most extensive, most wonderful tasting, most reasonably priced food and beverage portfolio that you may ever endeavor upon. 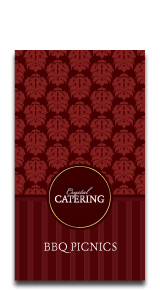 We will work with you and cater to YOUR needs to make sure that your special day is perfect. 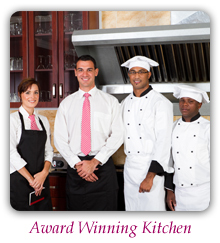 Kitchen Experience - Our chefs have been delighting customers for over 30 years! Ranging from the top culinary schools in the nation to management in 5 star resorts. Combining their experience and their love for food brings us to the forefront of Southern California catering. The difference between us and our competitors will be "Crystal Clear". We pride ourselves in not only the taste and quality of our food, but also our vast selection and seemingly endless possibilities. If there is a particular item that you are looking for and can't find please let us know what it is as we would love to accommodate you if at all possible. Please take a look at the appropriate menu and then contact us so that we can answer any questions that you may have.